CREATIVE LATE BLOOMERS : TRAVELING NEVER GETS OLD -- AND NEITHER DOES THE TRAVEL MEMOIR. JUST ASK OPRAH. TRAVELING NEVER GETS OLD -- AND NEITHER DOES THE TRAVEL MEMOIR. JUST ASK OPRAH. Do you have enough travel stories to fill a book? Do you want your grandchildren and great-grandchildren to see the world through your eyes? Do you dream of getting paid to travel? If you said yes to any of these questions, you may be the victim of a highly contagious disease known as the travel writing bug. Don’t be alarmed. There is a cure. Write a travel memoir. That is beginning of my description of the Travel Memoir class I am offering June 6 on the campus of Eckerd College. It's my first OLLI class. OLLI stands for Osher Lifelong Learning Institute. The concept of OLLI is simple: Curiosity never retires. OLLI, which exists on campuses across the country, is a membership organization that offers learning opportunities to midlife and older adults (50 and older, that is). Members pay a small annual fee and then can attend a whole slew of lectures, go on dozens of educational excursions and form special interest groups, all for very reasonable prices. In my course description, I cite two memoirs that have been huge bestsellers: Peter Mayle's A Year in Provence and Elizabeth Gilbert's Eat, Pray, Love. Breezy reads, they are not, I admit, the most adventurous examples of the genre. But wouldn't the bandits, dervishes and idol worshippers in more grittier memoirs, such as Freya Stark's The Valley of the Assassins, have scared people away? No, it turns out. According to an informal survey I made on Facebook and Twitter, in preparation for the class, the grittier, the better. At least that was the case for those who answered my post, "What Is Your Favorite Travel Memoir?" No one who responded even mentioned Eat, Pray, Love. Mindi Dickstein, a lyricist and a librettist who teaches musical theater at New York University, did single out A Year in Provence, but she clearly was far more excited about her other two picks: Bruce Chatwin's The Songlines and David Rieff's Going to Miami (the latter, which details its own version of bandits, dervishes and idol worshippers in Florida, has been called an "anti-traveloque"). She just wasn't certain they qualified as travel memoirs. She needn't have worried. The genre covers a lot of territory. The titles my social networking friends suggested, in fact, were quite literally all over the map. Susan Farewell, editor-in-chief of FarewellTravels.com, suggested Lawrence Durrell's Bitter Lemons ("really a memoir of Cyprus") as well as Durrell's Spirit of Place: Letters and Essays on Travel. An American expat living in Singapore who tweets @chamorro_chica and blogs at chamorrochica.com offered up Machu My Picchu by Iris Bahr. Barbara Kagan, a graphic designer at Southern Connecticut State University, chose Tony Horwitz's Baghdad Without a Map and Other Misadventures in Arabia. Janet Krietemeyer Keeler, a travel and food editor, confessed her preferences were Nothing to Declare by Mary Morris and Shopping for Buddhas by Jeff Greenwald while her colleague at Tampa Bay Times, Florida culture writer Jeff Klinkenberg, gave a nod to both Bruce Chatwin's In Patagonia and Peter Matthiessen's The Snow Leopard. Everett Potter, publisher of Everett Potter's Travel Report, also tweeted The Snow Leopard as his fav to which travel editor Veronica Stoddart at USA Today replied, "Ditto." Minnesota Star Tribune's Laurie Hertzel gave a shout out to all of Eric Newby's books, particularly A Short Walk in the Hindu Kush. Book critic Carole Goldberg (formerly at the Hartford Courant) chose Revolution: The Year I Fell in Love and Went to Join the War by Deb Olin Unferth. One-Minute Book Reviews Jan Harayda recommended A House Somewhere: Tales of Life Abroad, "a collection of 26 essays by (mostly) well known travel writers or journalists on their favorite places," including Tim Parks, Simon Winchester and Frances Mayes. Former National Book Critics Circle president Jane Ciabattari picked On Persephone's Island: A Sicilian Journal by Mary Taylor Smith: "I've reread it many times. Great one!" Someone directed me to the London Telegraph's recent list of "20 best travel books of all time." Surprisingly, it includes seven novels: Jack Kerouac's On the Road, Alex Garland's The Beach, Jan Morris' Venice, Ernest Hemingway's The Sun Also Rises, Arundhati Roy's The God of Small Things, Hunter S. Thompson's Fear and Loathing in Las Vegas, and Graham Greene's Our Man in Havana. Can a travel memoir be fiction? I usually think of a memoir as a work of non-fiction, but all of those novels do combine a fierce sense of place with intense personal reflection, a good definition of a travel memoir, I think. Often a sense of place so dominates a fictional narrative that it does feel like a travel memoir. When I go to Paris, for example, I like to bring along the latest mystery by Cara Black. Starring Aimee Leduc, a half American, half French detective, Black's mysteries are set in various quartiers across the City of Lights (Murder in the Marais, Murder in the Latin Quarter) and are chock-a-block with interesting facts and reflections about those neighborhoods. The Venice-based mysteries of Donna Leon (Death at La Fenice) are like that, too. Natch, Black answered my question, "What Is Your Favorite Travel Memoir," with a French-drenched title of non-fiction: Almost French by Alexandra Turnbull. An Australian journalist, Turnbull only meant to stay a week in Paris when she agreed to meet her lover there in the mid-1990s. She ended up calling it home. And speaking of home, can a book describing a city where the author grew up still be considered a "travel" memoir? That latter question was posed by Gina Vivinetto, who teaches creative writing at the University of Tampa. She was thinking of Orhan Pamuk's novel Istanbul. Yes, I say, yes! Istanbul is a perfect example of the double nature of the travel memoir as both exterior and interior journey. Pamuk shows us the city that is around him and within him. For me, travel memoirs capture the spirit of a particular time and place but also the transformation of the person who is doing the observing of that time and place. Ultimately, they are descriptions of personal journeys. And what could be more personal a journey than the one taken to discover the place of one's very roots? Tame. Gritty. Fiction. Non-fiction. Home. Away from home. So what from all these examples can we conclude makes for a good travel memoir? Clearly, the best examples of the genre work on several levels at once. 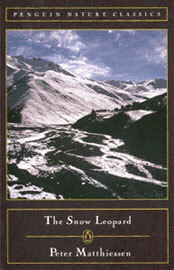 Take The Snow Leopard, the most frequently mentioned title for fav travel memoir in my Facebook and Twitter survey. In The Snow Leopard, published nearly 40 decades ago, Peter Matthiessen describes a hike he took in the fall of 1973 that took him 250 miles into the heart of the Himalayan region of Dolpo, "the last enclave of pure Tibetan culture on earth." His journey with zoologist George Schaller is purportedly about tracking down the elusive big cat of the title, but through the eyes and pen of Matthiessen, the trip becomes a spiritual quest, a search for nothing short of the meaning of life itself. Very Buddhist, just like its author. The author of this book has the perfect name for a travel writer. And that's no accident. In 1995 the author of Wild legally changed her name to Cheryl Strayed, a moniker she chose herself. I was unable to find out what her original name had been, but the change certainly reflects the theme of self-affirmation that has made her memoir a bestseller (and, most likely, is what so attracted Oprah to it). Like Matthiessen, Strayed's hike was arduous and challenging. But, again like Matthiessen's lyrical ruminations in The Snow Leopard, the real story Strayed tells us in Wild is not about the rattlesnakes and black bears, the searing heat and freezing temperatures nor the stunning views and interesting people she meets up with on her 1100-mile solo trek. It's about the inward journey she takes. It's about her discovery of that Buddhist of Buddhist truisms used by Jon Kabut-Zinn for the title of his book on the mindfullness of meditation: "No matter where you go, there you are." It is what lies at the heart of every great travel memoir and it is why we love to read them. "To awaken quite alone in a strange town is one of the pleasantest sensations in the world," writes Creative Late Bloomer Freya Stark in Baghdad Sketches, one of 30 travel books the intrepid British traveller wrote from age 42 until her death at age 100. "You have no idea what is in store for you, but you will, if you are wise and know the art of travel, let yourself go on the stream of the unknown and accept whatever comes in the spirit in which the gods may offer it. For this reason your customary thoughts, all except the rarest of your friends, even most of your luggage -- everything, in fact, which belongs to your everyday life, is merely a hindrance. The tourist travels in his own atmosphere like a snail in his shell and stands, as it were, on his own perambulating doorstep to look at the continents of the world. But if you discard all this, and sally forth with a leisurely and blank mind, there is no knowing what may not happen to you."